My fantasy Christmas flash story "Global Warming" was published a couple of days ago at the online magazine 10Flash. You can read it for free here. And as long as you're at 10Flash, why not check out Robin Graves' flash story, "Unlimited Delta," which can be found here. Robin is in my Orange County, California, critique group, and this is his first published story. Yay, Robin! The blog The Embraced: Scribal Love published an interview with me this week. You can find it here. My mother never let me babysit; she thought the house could burn down around me and I wouldn't notice because I would be engrossed in a book. Of the people whom I consider my ten closest friends, the youngest is 24 and the oldest is in her 80s. If I could be any animal I chose, my first choice would be some kind of hawk. My second choice would be a black bear. I spend on average ten to fifteen minutes a day looking for things I've misplaced. I spend four hours a week in bellydance classes. That's fewer hours than my classmates spend, so I'm close to the worse dancer in all those classes. The Riverside (California) Art Museum has a picture of one of my tattoos on display. 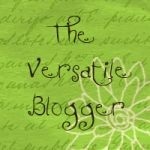 My time is short this week, so I'll post my own nominations for the "Versatile Blogger" award another week. My name (and associated page) is not up at the Campbell Award Website yet, but it should be soon. I would greatly appreciate your vote if you believe I am among the best of the eligible new writers. The museum took several photographs of both, and the friend who told me this week about seeing my photo at the museum didn't mention which tattoo it was. I need to get downtown and see for myself. I hear you on the hunting for misplaced things. Man I waste some time on that. Congrats on the successes. I'll check out the links. Your story almost made me cry, hon. Your list of things to do in 2011 is quite a long one--can I please hide away in one of your suitcases? Your travel itinerary sounds wonderful. Love the listing of books you have read, and the breakdown of each. Also would love to join the belly dancing class as my exercise level is increasing....sounds like a great way to strengthen up the important abdominal muscles to help the old back! !